Welcome to the National Centers for Environmental Prediction (NCEP) North American Regional Reanalysis (NARR) Homepage! Here you will see all sorts of information regarding the NARR and some of the results. Currently under construction. Please read the privacy and collection of information policy for this website. NARR DATA AVAILABLE AT NCDC! ALL YEARS 1979-present!! Click here to download data. Data also available at NCAR. Click here to get data from there. Note that there is a 1/2 month delay before files are available. Have a question about NARR? Click here to see if your question can be answered before you contact us. Click here for latest updates of presentations and documents. MOLTS is Model Output Location Time Series. They are files that contain hourly model soundings interpolated to stations. They are BUFR files. Unfortunately the MOLTS files were not properly created during the execution of the NARR. As a result they are not available, and there are no plans currently to create new files. We apologize for any problems this may have caused. Click here for a sample script for downloading the data at NCDC. Click here for a guide and another script for downloading the data at NCDC. Click here for a pdf file that contains the entire list of variables in the files. On 11 January 2005, as part of the 85th AMS Annual Meeting, the North American Regional Reanalysis Workshop was held, with presentations from NCEP scientists as well as NARR users. Below is a list of presentations by NCEP scientists, all in Power Point format. Input observations into NARR. Includes information about precipitation. Land-surface model in NARR. Includes some important results that pertain to land-surface issues. User issues. Includes important information as to how to download data and read it. Below is a list of presentations presented by users of the NARR at the NARR Workshop. Format noted. Assessment of energy and water budgets in pdf format. NARR data at NCAR in Power Point format. Comparison of NARR, ERA40, and observations at Hudson Bay, in Power Point format. Water budgets in Canada in Power Point format. Moisture fluxes in NAME region warm season' in Power Point format. 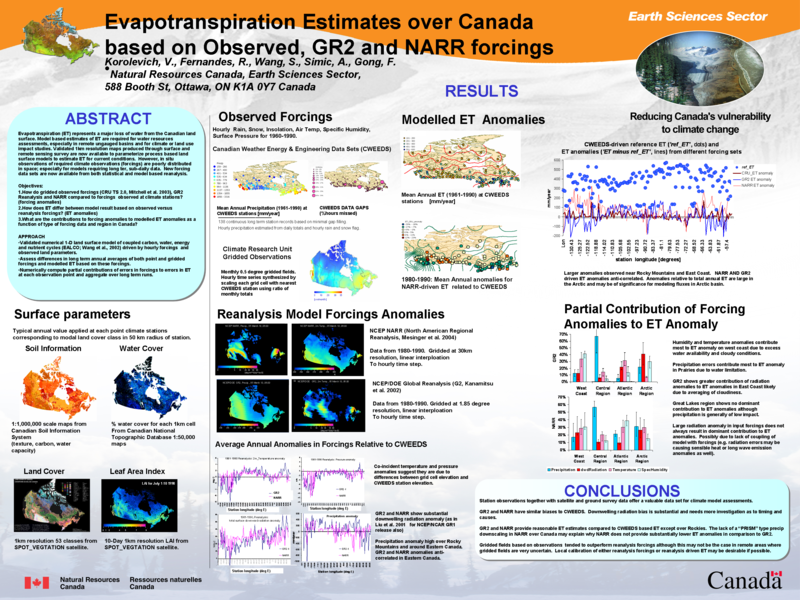 Climatological ET vs. NARR in Canada' in PNG format. Impact of NARR on Regional Climate simulation with Eta in Power Point format. For the land-sea mask and the latitude and longitude of our grids, as well as other fixed-fields in the NARR, in GRIB format, RIGHT click with your mouse below. After saving these files, if you would like to plot these fields using GrADS, plase use this control file. Note that you can only use this control file on the AWIP32.fixed file. Updated on 18 November 2004! Data is now available at the National Climatic Data Center (NCDC)! Click here. Files are now available! Only daily tar files are now available. To get a data plot of any variable in the NARR files, click here. Maps, time series, or other plots can be created and downloaded. Continue to check back to this site frequently for updates. Data is continually being downloaded to the nomad4 server. What data are on these files? There are two files for each 3-hr time period. Scroll down and click on the sample.a.ctl and the sample.b.ctl files for a list of what is available. These files also serve as GrADS control files should you wish to make plots of the grib files. The main file (the "a" file, though there is no "a" in the file name) contains the complete archive of all analysis variables valid at the time indicated in the filename. In addition, the "a" file has 3-hr accumulations (e.g. precipitation) and averages (e.g. sensible and latent heat fluxes). The "b" file contains the instantaneous values of items that were averaged in the "a" file, such as the heat fluxes. This file here lists the contents of the "merged" files. Note that this is an inventory of our "original" merged files, and the content and organization of files at the two archiving centers differ. We are in the process of moving the data from our Mass Storage system here at NCEP to our data centers at NCAR, NCDC, and the San Diego Supercomputing Center. That effort is ongoing, since it is a very large dataset that we have to move. When the entire 24-year dataset is available, we will let users know. To inquire about receiving NARR data, send an email to Fedor Mesinger. Click here to see the NARR team members. Note that there is at least 15 months of overlap between streams. That is due to spin-up issues. Many of you received a CD-ROM at the 84th AMS Annual Meeting in January 2004 in Seattle, WA. Here is a list of the contents of that CD-ROM. A README file explaining what is on the CD. Preprints of the talks/posters presented at the 84th AMS Annual Meeting. The same preprints are presented below. A description of the NARR output, including a comprehensive list of available variables and the volume size. The same description can also be found here. This is a pdf file. 24 years of plots, in PNG format. The plots are mean sea-level pressure, 500-mb heights and temperatures, and precipitation. Click here for a list of corrections that were discovered and noted after the CD had been made and distributed. Here is the topography for the production runs. The plot is courtesy of Matt Pyle of EMC. Email comments to Perry Shafran, administrator of this web page.